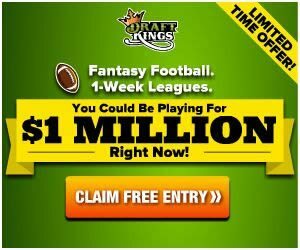 DraftKings announced their first $500,000K Fantasy Football Pick’Em Championship! The 1st place champion will receive $100,000! The top 100 qualifiers will cash out! The top 30 finalists compete live in Miami, FL for the championship! The DraftKings live Pick’Em championship will be held on December 17th, 2017 (NFL week 15) in Miami, FL. Each finalist will receive a VIP package ($6,000 value) including a four night trip (arriving on December 14th, 2017 and departing on December 18th, 2017) for two and a $1,000 credit for round-trip airfare. Qualify for the round of 100 between NFL week 2 and week 12. The 100 qualifiers will compete online in week 13. The top 30 finalists advance to Miami in week 15 for the final! You may qualify up to three times for this tournament. The DraftKings Pick’Em championship is a qualifier event only. Entry fees for satellite and qualifier contests vary. 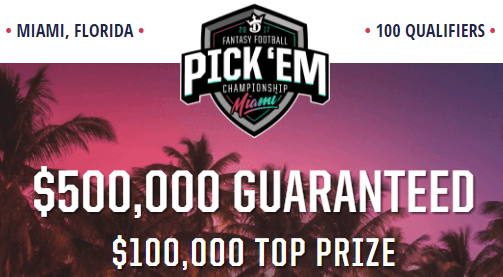 Fantasy footballers, don’t miss out on your chance for your share of this guaranteed $500,000 prize pool in the world’s largest daily fantasy football Pick’Em championship!